UCF defeated teams from Harvard, MIT and Stanford, among others, to finish first in the U.S. and Canada. 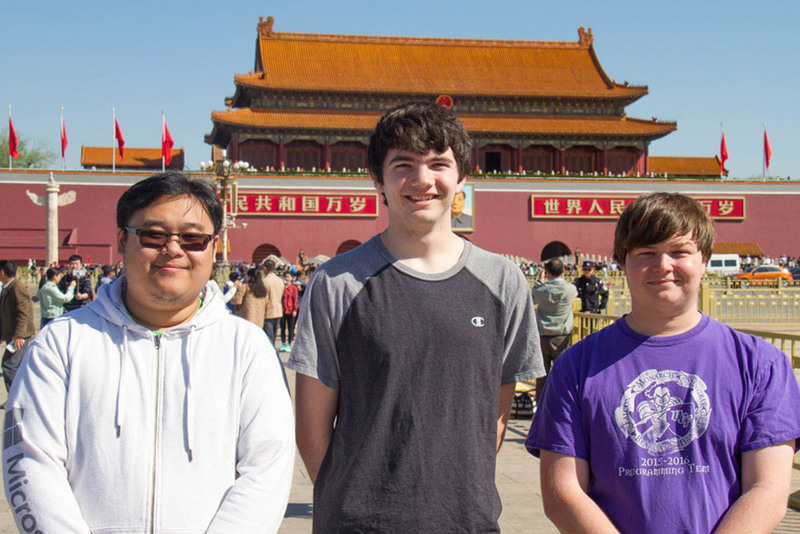 Computer science students Eric Ly, Alex Coleman and Timothy Buzzelli represented UCF at the International Collegiate Programming Contest in Beijing. UCF’s student programming team ousted all competitors from the U.S. and Canada to finish first in North America and 10th worldwide in the Association of Computing Machinery’s International Collegiate Programming Contest held in Beijing this week. This was the team’s highest finish in more than three decades of competition. “It was great to show North America — and the world — that UCF is right up there with the rest when it comes to computer science and competitive programming,” says Timothy Buzzelli. The 3-member UCF team, comprised of computer science majors Timothy Buzzelli, Eric Ly and Alex Coleman, advanced to the international competition after winning the southeast regional championship in November. This year, 49,935 contestants from 3,098 universities in 111 countries competed, with the top 130 teams advancing to the worldwide finals in China. This is the sixth consecutive year UCF’s computer programming team has won the regional championship and earned a spot in the prestigious international event. During the competition, teams tackle eight or more complex, real-world problems, working under an intense five-hour deadline in what is known as the “Battle of the Brains.” Teammates collaborate around a single computer in a battle of logic, strategy and endurance that requires precision, problem-solving and an understanding of advanced algorithms. Incorrect solutions are assessed a time penalty. To win, a team must solve the most problems in the fewest attempts in the least cumulative time. UCF defeated teams from the Columbia, Cornell, Harvard, Massachusetts Institute of Technology, and Stanford, among others. This year, Moscow State University was named the worldwide champion. Buzzelli and Coleman are also members of last year’s UCF team that finished 13th at the international competition and was the highest ranked team from the United States. Computer science Professor Ali Orooji serves as the faculty advisor for the team.